Handlebar, Control & Reservoir Mount! Vibration is bad. It tends to rattle things out of place and wear things down. Vibration is especially bad when it breaks things that are not designed to withstand it, such as your GPS, cell phone, MP3 player, camera, radar detector or that other expensive gizmo that you have mounted on your bike. The ADTV line is specifically designed to minimize the vibration transferred from your bike to your gadget with the patent-pending Anti-Vibration Technology. Traditional mounts have a single top plate that transfers vibrations directly from the bike, through the mount, right to your gadget. The ADTV line, however, is designed with two plates separated by vibration dampers. Your gadget mounts to the top plate only. With this design, the vibrations are absorbed through the dampers before they reach your expensive gadget. Choosing a mounting system has always been a tradeoff between adjustability, ease of installation, aesthetics, size, and vibrations. With the ADTV line, you get it all. The double ball-joint design provides a high degree of freedom for optimal positioning, easy adjustment, and simple installation. High strength steel and aircraft grade aluminum components ensure a sturdy connection, while the Anti-Vibration technology protects your gadgets in a sleek, compact design. Finally, a mount that does it all. 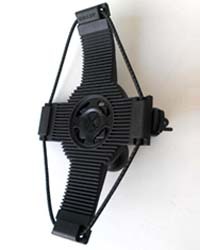 ADTV-1: Handlebar with a diameter between 7/8” and 1 ¼” and open space of ¾” or larger. 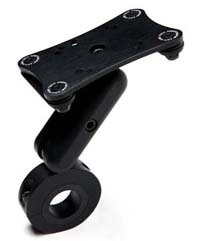 ADTV-2: Controls mount, two pinch bolts facing toward back of the bike spaced 1 – 9/16” or less apart. ADTV-EXT: Made from high strength steel and aircraft grade aluminum, this extension adds another 2.5" to the length of the mount and provides additional adjustability. Very useful in tricky applications to get the device exactly where you want it. ADTV-EXTC: Similar to above but in chrome. ADTV-201: This adjustable cradle holds most cell phones and MP3 players, including iPhones and iPhones with thin protective sleeve. Cushioned, retractable side arms hold the device safely and securely. Squeeze sides to secure device and push the button on the side to release. Movable foot pegs can be adjusted for charging connections. ADTV-EUS: The Universal Smartphone Holder features secure strap design that will hold devices such as smartphones, GPS units, cameras, transponders, and other electronic items. It will hold something as small as a traditional flip phone all the way up to the largest smartphone available today. It is compatible with all AdaptivMounts. ADTV-UDH: The Universal Device Holder is designed to hold devices such as smartphones, GPS units, cameras, transponders, and other electronic devices whether with or without protective case up to 5/8" thick and 4 ¼" wide. It is compatible with all the ADTV mounts. ADTV-XMT: The Grip features four leg design that offers impressive holding power. 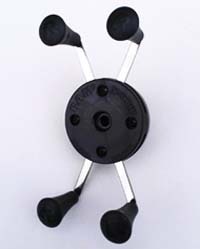 The spring loaded legs are easy to open and close. 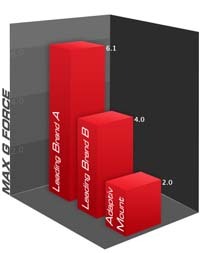 Will hold most devices with widths from 1.875” up to 3.25”. 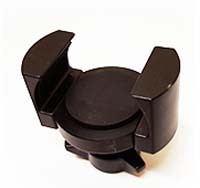 Note that this product has a flat back and is to be bolted onto a flat surface with the supplied screw and nut. ADTV-214: This adjustable cradle holds most smartphones both with or without protective sleeve, including Droids and iPhones with thick protective sleeve. Cushioned, retractable side arms hold the device safely and securely. Squeeze sides to secure device and push the button on the side to release. Movable foot pegs can be adjusted for charging connections. Fits devices 2.25 to 3.5 inches wide. ADTV-202: This adjustable cradle holds most GPS and other large electronic devices. Cushioned, retractable side arms hold the device safely and securely. Squeeze top and bottom to secure device and push the button on the side to release. 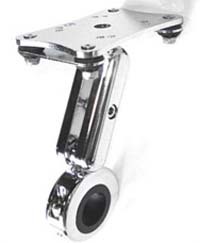 Movable foot pegs can be adjusted for charging connections. Fits devices 2.25 to 3.25 inches tall. ADTV-304: Made from aircraft grade aluminum, this plate extension allows for two devices to be attached. ADTV-215: This water resistant soft case holds most smartphones, cell phones, and MP3 players. Water resistant zipper around the case. Fits devices up to 2.25" by 3.75". ADTV-216: This water resistant soft case holds most GPS and larger electronic devices. Water resistant zipper around the case. Fits devices up to 4.25" by 2.5". ADTV-217: This waterproof hard case holds most smartphones, cell phones, and MP3 players. Fits devices up to 2.25" by 5". ADTV-218: This waterproof hard case holds most GPS and larger electronic devices. Fits devices up to 5.5" by 3.5".